Thread: How do you guys clean your muffler / exhaust system? Drove up behind my 981BS in the garage with headlights on in my other car and noticed that the muffler looked a bit brown . I got stuck into them with AutoSol and this thick brown residue started to come off slowly. They are almost back to the way they should be after a 2nd application. Just wondering how often you guys have to do this or at all? My car is only 6 months since delivery so I'm surprised it could get such a nasty build-up so quick to deter from the nice metal shine.?? Re: How do you guys clean your muffler / exhaust system? Last edited by Kendapau; 03-30-2014 at 12:45 PM. 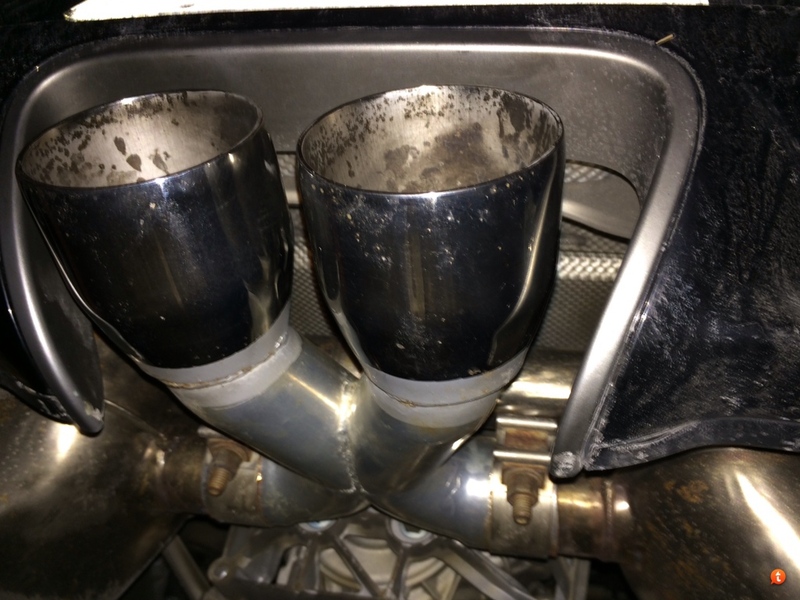 Carnewal GT cat-back, DREAM 2 exhaust tips. I use Simple Green Motorsports. It comes in the blue bottle. Works the best, any dirt, soot, etc, comes right off.